Apostille Canada what is it or how do I get one? Are probably the two most common questions that we have gotten over the past 25 years of providing our specialized international document services. After being told to get an Apostille Certification for a Canadian document clients are surprised to find out they can’t get one for their document in Canada and most still don’t understand what it is. To help this article will shed some light on what it is and why you can’t get one in Canada under the Hague Convention. Hague Apostille Convention Does it Apply in Canada? In the 1950’s as world trade grew so did the need to provide documents in other countries for personal or business reasons. At that time to have a document accepted as being valid in another country it needed legalization. This in most cases also included another step called authentication which being a two step process many found it inconvenient. After much study and many drafts the Hague Convention of 5 October 1961 Abolishing the Requirement of Legalisation for Foreign Public Documents, commonly known as the “Apostille Convention” was signed. Which is why many of our clients ask us to get one for their Canadian document. The convention was established to abolish the requirement for the legalization of certain foreign public documents. The idea is to shorten the original process of authentication and legalization for some public documents so that they can be accepted as being valid in another country. The convention does not abolish the requirement that a document must follow a specific process for validation before being used in another country, it establishes a shorter process to follow. There are currently 112 countries who have signed the convention whereby they follow the new practice. The most recent country to sign the Hague Convention is Chile declaring its competent authorities January 4, 2016. Although Canada is still not a signatory it is studying the idea of becoming a contracting partner I talk more about this later in the article. It’s important to note that the process is a confirmation of signature, the content of the document is not validated. As recognition of this fact the Hague Convention in 2009 amended the wording on Apostille Certificates to state that no one has checked whether the document contents are genuine or fake, that the process is signatory based. As an update to this article on September 6, 2017 The Government of Canada has added a similar wording to their authentication stamp that states “The department does not validate the content of the underlying document “. This newer international document validation process, as with the original process, is to remove the burden on the receiver of a document as to the validity of the authority’s signature on the document being presented. The convention does not apply to documents issued by diplomatic/consular agents or documents related to commercial/custom matters. The Government of Canada has not signed the convention but it is currently studying the idea. Responding in a recent Hague Conference questionnaire that it has no projected time line for an outcome on the study of implementing this new process in Canada. In 2015 Authentication Legalization Services Canada was contacted by Global Affairs Canada about our opinion on the idea of joining the convention. 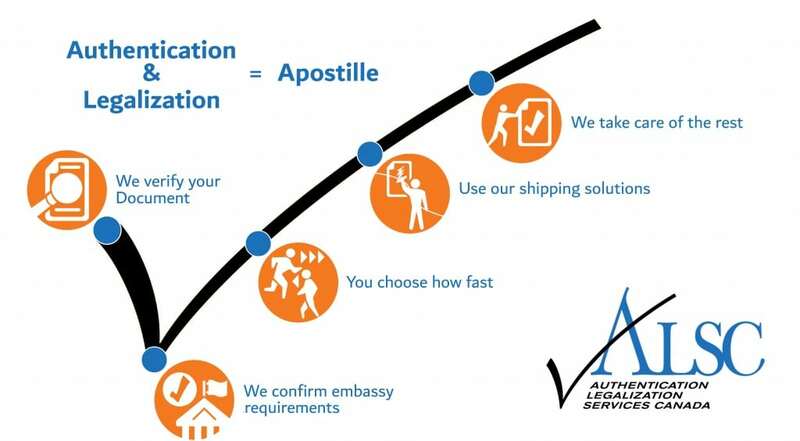 Having experience of working with both the Apostille process and the current authentication legalization method in Canada, we were happy to provide what we saw as the pros and cons of both. In addition, although not a party to the convention, Canada has sent representatives to Hague Conference conventions so who knows maybe sometime in the future you will be able to get one in Canada. But until then here is what you should do if you are asked to get one for a Canadian document. Since Canada is not a party to the convention the original two step verification process of authentication and legalization is still followed, this is the accepted equivalent of an apostille certificate. The first step of authentication takes place at Global Affairs Canada Authentication Services Section here in Ottawa. They will verify the official signature on your Canadian document such as a Birth Certificate, Marriage Certificate, Degree, Power of Attorney or Corporation document to name a few. Once satisfied, Global Affairs Canada will affix their seal and signature along with the spelling of the name of the official who signed the document. This is done so the receiver of the document knows that the official who has signed the document is genuine and has the authority to do so. Although if dealing with Global Affairs Canada directly by mail or courier it takes 20 business days to authenticate a document we can do it in as quick as one day feel free to ask us how. After authentication the next step of legalization of a Canadian document completes the Apostille process in other countries. This happens at the embassy of the country where you are going to be using the document, which most are located here in Ottawa. 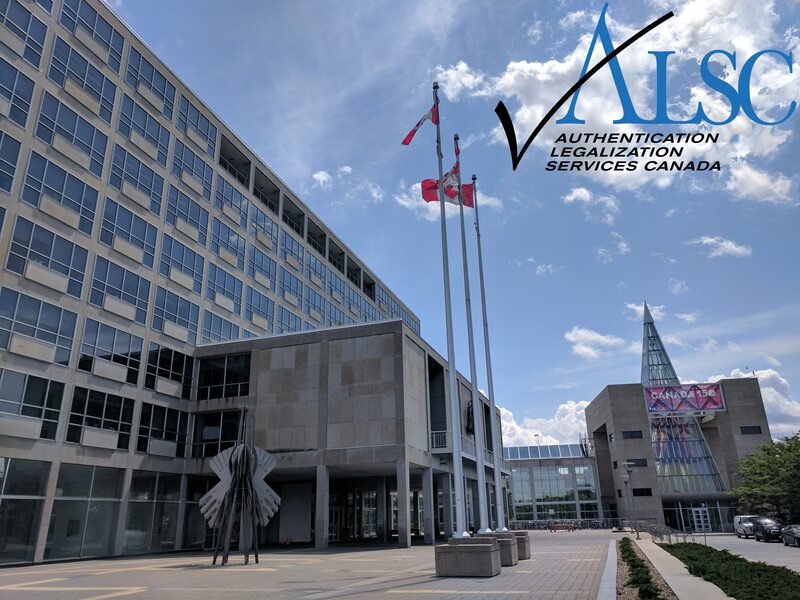 After providing the required fees and any additional requirements the embassy consulate official will verify the signature of Global Affairs Canada Authentication Services Section. In addition to the embassy signing and stamping the document they may also put a registration number on the document for reference in country. So whether you have been asked to get an Apostille or Authentication Legalization for a Canadian document, what somebody wants you to do is prove that the person who has signed your document has the authority to do so. It’s sometimes funny for our clients to hear that we still work in the paper world of signature and stamps but times are changing. Since its ratification, the Hague Conference is further studying other ways at making the process easier and more secure for the validation of certain public documents for use abroad.Currently, in conjunction with the National Notary Association (NNA) in the United States, it is working on the creation of an electronic apostille system or what has become known as e-APP. The Hague Conference sees the e-APP program as a strong tool in combating fraudulent Certificates, which has become an issue. The e-APP program would rely on an e-Register component. The e-Register would allow the competent authority to electronically record each certificate it has issued in a central register. Any party presented with a Certificate would then be able to confirm its validity through an online secure search using the number and date of issue which would confirm if there is a match in the e-Register.